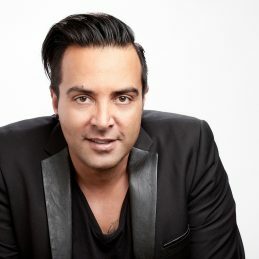 One of Australia’s most dynamic performers, singer, songwriter and original founding member of the iconic Australian Band Taxiride, JASON SINGH has over 20 years experience in the industry delivering energetic power-packed performances. With TAXIRIDE Jason, was at the top of the Australian music industry with nine top 40 hit singles including the top five hits “Get Set”, “Everywhere You Go”, and the most played song on Australian radio in 2002 “Creepin’ Up Slowly”. Establishing itself as one of Australia’s premier live bands playing countless sold out shows, Taxiride toured the world including supporting Tina Turner across Europe with two sold out shows at Wembley Stadium. Taxiride enjoyed two consecutive number one platinum selling albums and won the 1999 ARIA for ‘Breakthrough Artist – Single’. As a solo artist, Jason has had two Top 10 ARIA club hits with “The World As You Know It” and “One World”. In 2013 Jason released his highly anticipated solo album Humannequin, produced by the legendary Australian producer Charles Fisher. Humannequin showcases Jason’s flawless vocals and songwriting prowess to a tee. As one reviewer put it Humannequin “sets a new benchmark with sky scraping pop songs.” (Herald Sun, Melbourne). Following the success of Humannequin, In 2015 Jason Singh embarked on his most exciting and original challenge yet The Jason Singh Project. Setting himself a goal of delivering six singles in 12 months, Jason wrote, produced and released a new single every eight weeks out of his home studio in Melbourne. Each single from The Jason Singh Project demonstrated Jason’s innate sense of melody and classic songwriting ability. The tracks deliver against the range he is known for from big sounding multi-formatted pop rock tracks to synth-pop gems. Always writing, and with a new mantra of “Be Completely Vulnerable”, Jason’s new music planned for 2017 will see a departure from the power synth pop of the Jason Singh Project, and take a huge leap into the adult contemporary space, offering both modern sophistication and edge. “I want to be right where I am. Right where I’m standing, in my music and in my life”. Jason’s corporate clients include: Tennis Australia, Ronald McDonald House Charities, NAB, Toyota, Crown, Australian Hoteliers Association and the Melbourne Grand Prix to name just a few.